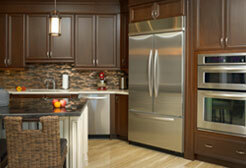 American Appliance has been providing unparalleled service to customers in the Greater Boston Area since 1956. As an authorized service provider for many major appliance brands, we guarantee professional repairs backed by our warranties. And as a small, family-owned business, we deliver that high quality service at affordable rates with a personal touch. We know you need your appliances back up and running as soon as possible. We move quickly to schedule your repairs (often same day) and keep a wide selection of major appliance parts in stock to reduce waiting times for ordered parts. The brands we service include: Admiral, Amana, Bosch, Electrolux, Estate, Fisher & Paykel, Frigidaire, GE, Hotpoint, Inglis, Insinkerator, Jenn-Air, Kenmore, KitchenAid, Magic Chef, Maytag, Roper, Speed Queen, Sub-zero, Tappan, Thermador, Viking, Whirlpool, Wolfe, and more. Based in Waltham, Massachusetts, we can send our technicians to service customers in the Greater Boston Area, including Foxborough. Our technicians are held to the highest standards with ongoing training from major appliance manufacturers. We are committed to ensuring 100% satisfaction for our customers. All of our repair work is backed by a 30 day labor warranty, and our parts and refurbished appliances… carry a 90 day warranty. Call today for the area’s best appliance repair service! Be sure to mention one of the deals on our Pricing page. © American Appliance. All Rights Reserved.